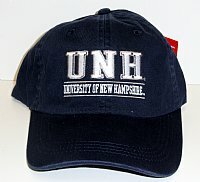 This Champion hat has the UNH Double Line design embroidered in white on front and Wildctas on the back of the hat. One size fits all with adjustable closure. Available in navy or white.